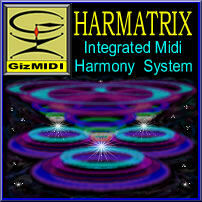 Harmatrix (formerly "Harmonist") contains two programs that can be used independently or together. 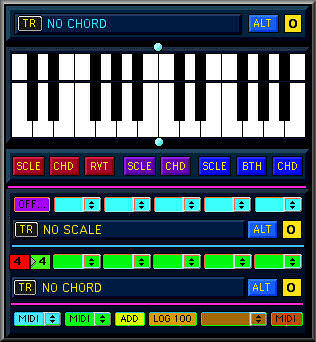 Scout -- powerful chord and scale calculator/MIDI harmony analyzer with 3060 chords, 744 scales and over 10,000 matches. Ranger -- ultra flexible, highly tweakable MIDI reharmonizer handles any scale, any mode, and any chord with precise control over inversions and grace notes. Harmatrix saves you hours of composition time and allows you to explore a universe of harmonic and melodic possibilities quickly and efficiently. Build progressions, melodies and bass-lines in a snap. Works with any sequencer. Analyze MIDI tracks or performances for harmonic content in real-time. Find all chords in a scale, or all scales containing a chord. Display, audition and transpose any scale or chord. Build chord progressions of any complexity, quickly and easily. Test progressions or groups of chords for scale matches. Weave subtle modulations for lush ambient pads and smooth jazz changes. Reharmonize any MIDI music from any scale or mode to any other scale, mode or chord in real-time with precise control over inversions and grace notes (accidentals). Totally tweakable! Download MIDI files and reharmonize into original compositions. Use with audio and vocal harmonizers that accept MIDI input. Even has its own integrated sequencer. Relax ... Explore ... Create. Harmatrix is a "must have" tool for any composer and a "can have" at only $39.95 (download).